This project creates strips of vegetal cover by planting bushes and sowing a mixture of cereals in order to control soil erosion. As a result, there is also better management of water and more plant diversity. Some areas of Murcia with permanent crops are seriously affected by soil degradation caused by hydric erosion. Slopes are easily eroded, which along with difficult climatology (heavy rains combined with dry spells) and misguided agricultural management, such as frequent and heavy ploughing, can worsen degradation of the land in the region. The RDP for Murcia includes agro-environmental measures including one designed to combat soil erosion. The objective of this project is to carry out an assessment of the current situation in those areas in where the measure "Preservation of Arable Lands" has been implemented. First year: to create the vegetal cover (strips of about 3 meters wide across the slopes, consisted of bushes, cereals and leguminous). Following five years: to maintain the vegetal cover and facilitate wild vegetation. Optional: to crush and add remains of pruning. Economic support is subject to: the use of local vegetation, an appropriate distance between strips, the protection and restoration of containment planks and the prohibition of ploughing toward the slope. The project is focused on arable lands with steep slopes (≥ 8%). So far, 98 farmers have implemented this measure, adding up a total of 1,200 ha cultivated, of which 95% is with almond trees, the rest with olive groves, vineyards and other fruits. 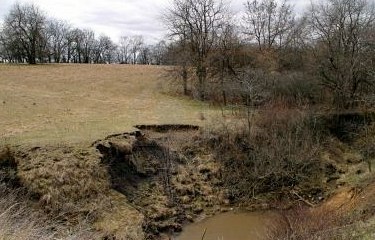 Preliminary results show an increase of covered land, preventing erosion through an efficient control of rain water and a progressive settlement of sediments. There are also potential benefits for biodiversity. There is a need to increase awareness of the problems related with soil erosion and the need to use more suitable agricultural practices. In this regard, training is of paramount importance through seminars, courses and technical assistance. There is a strong necessity to improve monitoring, assessment and dissemination of results in order to make its positive impact as widely recognized as possible. Basins of Alto Guadalentin river, Rambla de Nogalte river and Mula river.